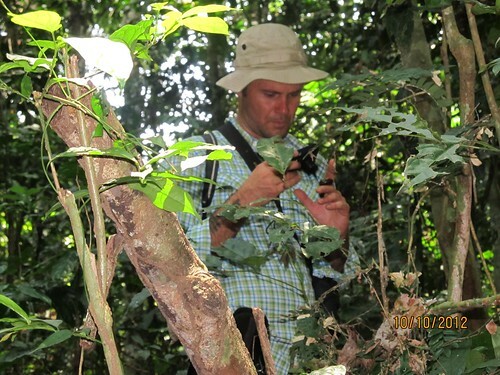 Searching for Bonobo in Congo » A Tomb for Whom – on the Lomami? 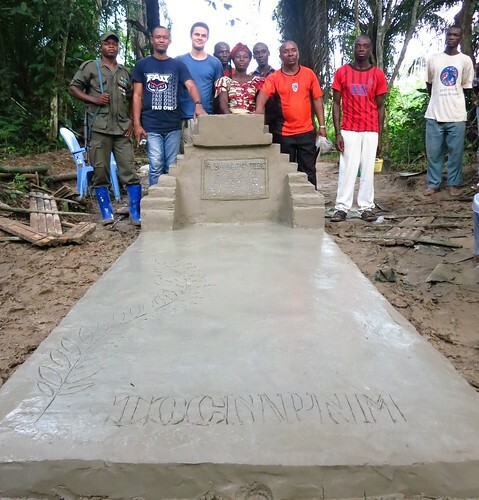 A Tomb for Whom – on the Lomami? 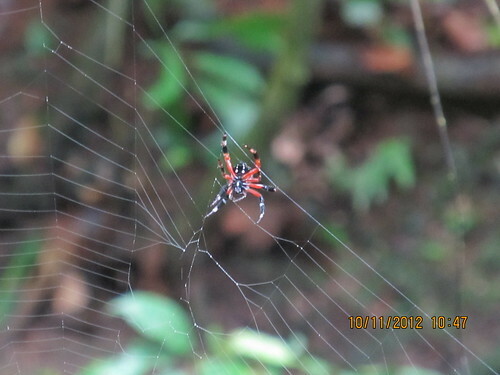 Roger was a volunteer with our project and an enthusiast of small creatures. Roger examining one of the fascinating minions of the forest. We returned to the encampment, nonplussed. We had brought with us to Obenge, at no small expense, three sacks of cement and a pile of good Belgian-era bricks. What to do with them? We threw ideas around: could we improve the spring? No, we didn’t have enough material, and besides, none of us knew how to do that correctly. If we were to damage the villagers’ only source of clean water we’d bring down more fire from villagers already uncertain what help we would provide if they moved. 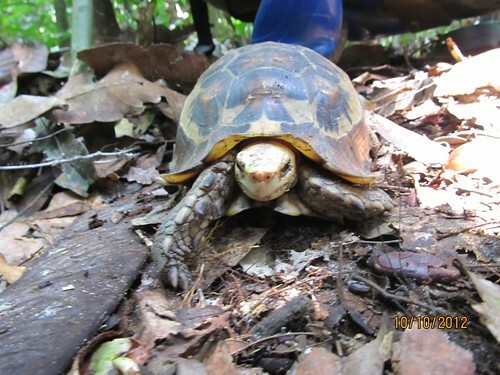 A tortoise on the forest floor. They did, however. Mama Chief loved the idea, but her family forbade it, fearing that it would incur a debt to our TL2 project. She had to refuse. We returned to the drawing board. 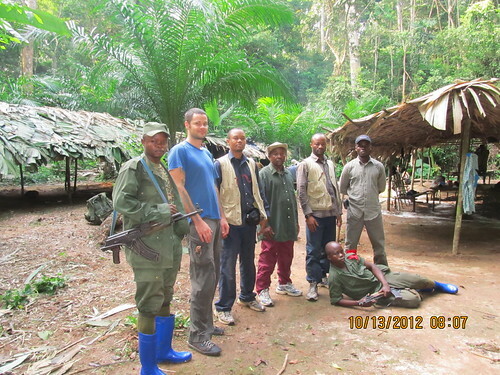 The lieutenant (front) with Roger and the TL2 camp leaders. “I know what to do.” said the Lieutenant, the ranking officer among the team of six ICCN park-guards, tasked with both protecting the encampment and enforcing laws related to conservation. “The guard that died this spring, Yumulani-Tebe. His grave is there in the village cemetery. We’ll use the cement and the bricks to build a grave marker for him. Such a thing is outside Mama Chief’s power to refuse. If we do that, we’ll have our monument.” He presented the idea to Mama Chief the next day, and she approved it. Singing and dancing at the grave site. 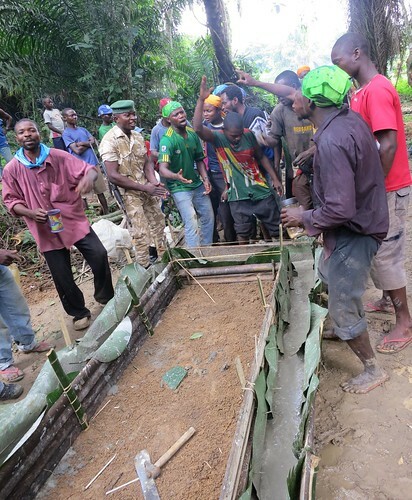 We laid the foundation for the tomb during a riotous celebration in the small graveyard at Obenge’s south edge. 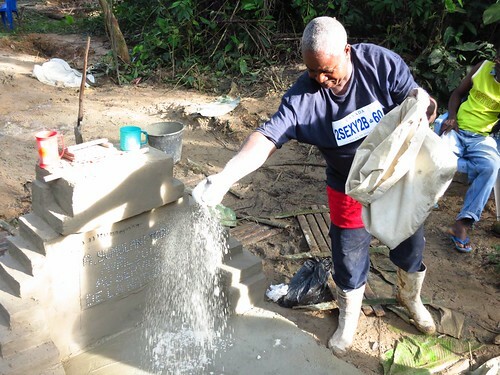 Fully half of the men in the village came out to help us mix and pour the rectangular base, under the careful supervision of Papa Stany, one of the pastors at Obenge’s Protestant church who happens to be an accomplished mason. A goat was killed and roasted, jugs of manioc liquor were procured and passed around, songs were sung and the wet ground stamped dry by the pounding of dancing feet. The ICCN guards troweled ceremonial passes into the wet cement, fired joyful rounds from their Kalashnikovs into the palm crowns, and danced for their dead colleague. 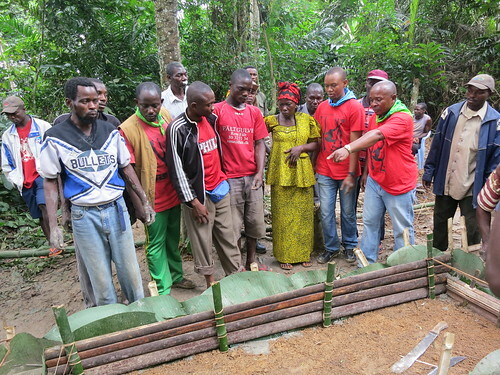 Maurice explains to Mama Longembengembe how the tombstone will look. Mama Chief came with her family and her coterie of notables to observe the work in progress; they were fêted in their turn by the enthusiastic crowd. Maurice described the work to her, modeling with his hands the shape that the monument would take. Mama Chief watched his hands move with a small twist of bitterness growing on her lips until she was picked up and hoisted in her chair by a gang of young men, who bobbed her up and down in rhythm with their song. A smile crept back onto her face and she whisked the length of printed yellow cloth she was carrying back and forth in time. 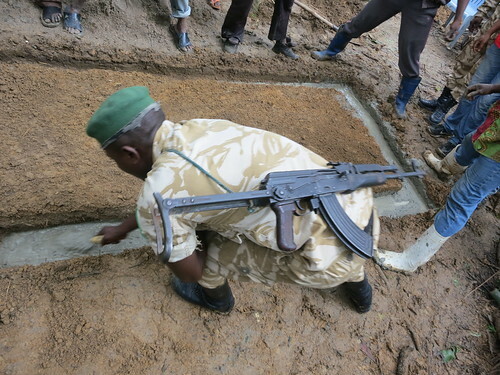 The park guards all contributed a trowel of cement. The young men put her down and turned to the lieutenant, who shook his head with an emphatic “No!” then, laughing, waved the barrel of his rifle as he was lifted over the heads of the crowd. 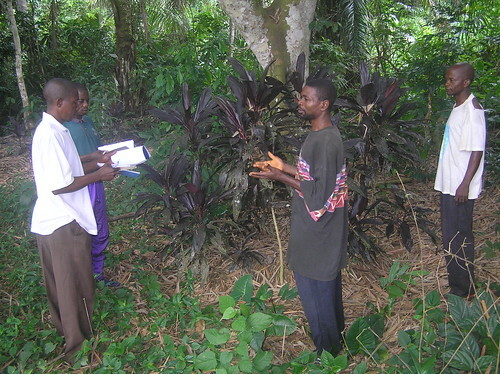 Behind the dancing scrum of men and youths the wind tossed the purple fronds of the plants marking the site of Obenge’s mass grave. Here the bones of the victims of the RCD officer, Dracula lie together, their cruel deaths without retribution. 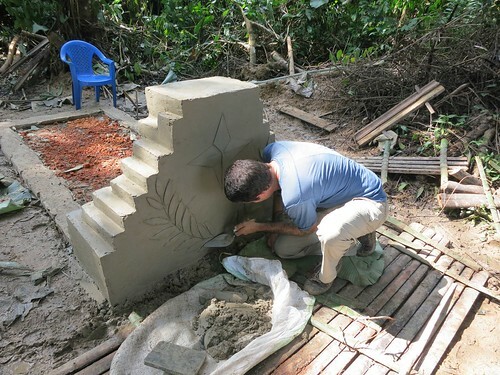 Stany works on the final stages of the tombstone. We returned to the tomb several days later to build up the headstone. Papa Stany scraped the bricks clean with a trowel and placed them in stepped courses, forming a small ziggurat which he sheathed in mortar. Roger works on the tombstone. I took the trowel and shaped a wreath of leaves on the back of the stone, and a compass-star above them. 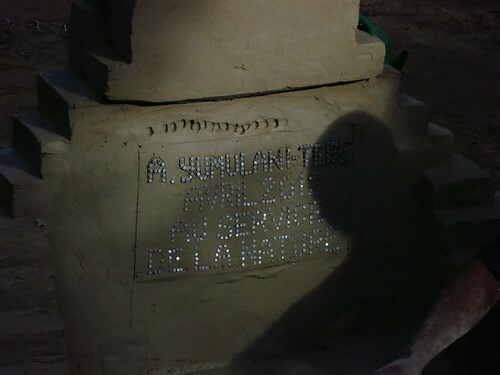 I inlaid Yumulani-Tebe’s name into thick, wet mortar with nails brought from Kisangani, and added the date of his death and the legend “In Service to Nature”. A tribute to the park guard’s service to nature. Papa Stany poured, coated and smoothed the broad surface of the tomb-bed. I used the point of the trowel to incise a simple branch and the letters “ ICCN/PNM” (the guard was “on loan” from Park National Maiko-PNM- when he died). We posed for a picture with Mama Chief, who had come to observe the completion of the project, and made our way back through town to the camp. The finished tombstone with mama chief’s approval. This entry was written by Terese Hart, posted on 2012-12-28 at 11:09 pm, filed under About the project, History of TL2. Bookmark the permalink. Follow any comments here with the RSS feed for this post. Post a comment or leave a trackback: Trackback URL.